← Want to tame and train your inner critic? – You learned this in kindergarten. Posted on April 7, 2014	by Denise Banks-Grasedyck, Coach. Consultant. Speaker. It usually happens about four minutes into the conversation. A few pleasantries are exchanged. The short bios are recited. I say that I have lived in Berlin for twenty-five years and then, they pop the question! No, not that one. The one I have been waiting for. The one that is part of my funny-spiel. Oh, if you could see inside of me, you would see the little hands of my inner child clapping with delight. This always, always, always get a laugh- albeit sometimes only from me. You see, I really enjoy making people laugh and unfortunately, I am not that great at telling jokes. Somewhere along the way, I decided not to let that stop me and discovered that that is perfectly fine. People like to laugh. It makes them (and us) feel good, so they are gracious and laugh. Within seconds of laughing we relax, our shoulders sink just a little and within minutes that initial stress of assessing this stranger subsides, we feel at ease with someone we have never met before. 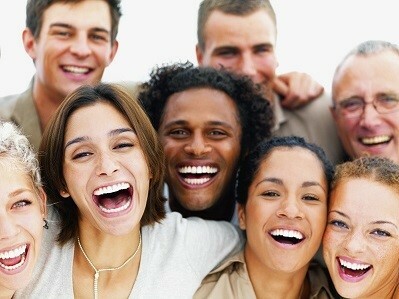 What some people don’t realize is how much good it does for our health when we laugh. Laughter has been proven to have both short-term and long-term benefits, including immediately reducing stress, lowering blood pressure and improving our mood. In that regard, laughing has a lot in common with aerobic sports, so you can either run a marathon or join a laugh-a-thon. Years ago I ran the Berlin marathon; I am sure it was right after that that I discovered my passion for laughing and bringing humor into the world. So, if you see me running more than 5k, you can be fairly sure that I am either being chased, or my skirt is caught in the door of a moving car. But I digress. So now that you know that laughing helps reduce stress, what now? I’m so glad you asked. The obvious and probably easiest thing to do now is laugh more! Expose yourself to more humor and opportunities to laugh as often as possible. •Get yourself a funny calendar or a joke app for your e-devices. •Buy a book of one liners or funny short stories and the moment you sit down at your desk, before you start working, get your five minute funny-fix. •Everyone has that one friend or family member, who always makes them laugh. Put your funny friend (sounds odd) on speed-dial! •Stop hanging out with Dan and Debbie Downer! Invite people who make you laugh out to lunch and join them for those short breaks in the office kitchen. •Play “Remember when”… whether at home or in the office, we usually have a few shared funny stories that can bring down the house with laughter, just by saying, “Hey, remember when….”. And, if all else fails, give me a ring for some of my, let’s call it “special” humor and don’t say, you weren’t warned. Here are some additional resources which you may find helpful or just plain funny. If you like this post, leave me message and share it with your friends and colleagues! This entry was posted in Burnout Prevention, Insights, Stress Management and tagged avoid burnout, resilience, stress management. Bookmark the permalink. I got this right on time! It is nearing 3 pm and the slump was starting until I read your post and watched that baby laughing at paper being ripped. His deep belly laugh produced one in me and my energy is back up to get me through the rest of my day. Thanks! Thank you, Patrice. Baby Micah had me laughing, too! This so true, thank you! I am typing my response while smiling and listening to baby Micah laugh at the ripping paper. There is nothing better to lift a moment, my spirit and bring me back to what matters most than a good laugh. And it is something I notice has been lacking in my life!! The other day we celebrated my youngest son’s birthday and watched videos of him and were all laughing so hard, it was such great connecting therapy! Thanks for the suggestions too, time to get on that! There is nothing funnier than a baby laughing. It’s one of the most gleeful and freeing sounds in the world. I so very much agree with the power of laughter. It has the power to heal. Thanks for reminding us to take time to laugh everyday. Important stuff!